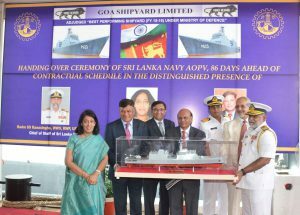 Continuing with its track record of last 4 years, Goa Shipyard Ltd has once again delivered 1st Sri Lankan OPV to Sri Lanka Navy ceremoniously on 22nd July 2017, 86 days ahead of schedule. The ceremony was attended by H. E. (Mrs.) Chitranganee Wagiswara, High Commissioner of Sri Lanka Navy in India, Rear Admiral SS Ranasinghe, Chief of Staff of Sri Lanka Navy, Admiral Arun Prakash, RAdm Shekhar Mital, CMD GSL, RAdm Vineet Bakhshi Ex-CMD GSL, Directors and senior officials of Sri Lankan Navy, Indian Navy, Coast Guard and GSL. SLOPV contract is one of the major export contracts, being executed by GSL currently for friendly countries. The Keel of the first vessel was laid on 10 Sep 2014 and was launched on 5th May 2016 at the hands of H.E. Mrs. Mridula Sinha Governor of Goa. It is creditable for the shipyard to complete the 100% hull construction and Handed over the vessel 86 Days ahead of contractual schedule. With this, shipyard has succeeded in reducing build period of 2500 Tonnes OPV to nearly 3 years from 5 years taken till about 3 years back. Significantly, the Handing over of first AOPV, designed in-house and built by GSL for Sri Lankan Navy come on the heel of Handing Over of 5th CGOPV of the series of six OPVs on 07th July 2017. Yard has a unique distinction of being the largest Exporter Shipyard from the country and has recently adjudged largest exporter of ships in India.